By 2000 the proportion of people in developing countries living in extreme poverty was down to a third. By 2010 it was 21% (or less than 1.2 billion; the poverty line was then $1.25, the average of the 15 poorest countries’ own poverty lines in 2005 prices, adjusted for differences in purchasing power). ♦ The global poverty rate had been cut in half in 20 years! There is a lot of debate about what exactly counts as poverty and how best to measure it. But by any measure, the eradication of $1.25-a-day poverty would be an astonishing achievement. Throughout history, dire poverty has been a basic condition of the mass of mankind. Thomas Malthus, a British clergyman who founded the science of demography, wrote in 1798 that it was impossible for people to "feel no anxiety about providing the means of subsistence for themselves and [their] families" and that "no possible form of society could prevent the almost constant action of misery upon a great part of mankind." ♦ For most countries, poverty was not even a problem; it was a plain, unchangeable fact! 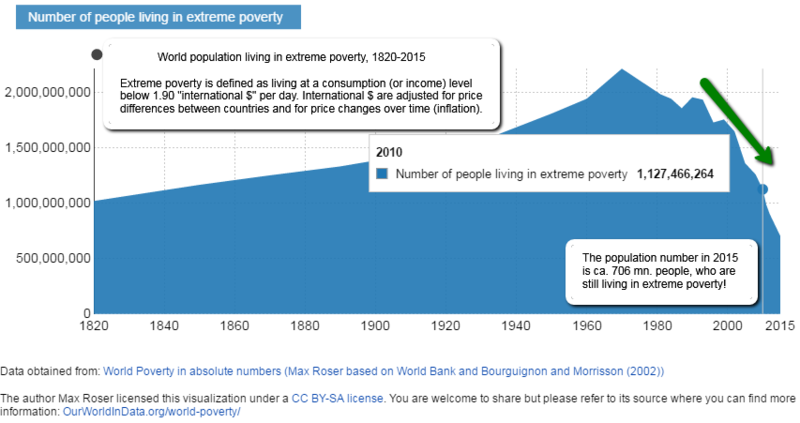 So how realistic is it to think the world can end extreme poverty in a generation? Well, it can be done. The world has not only cut poverty a lot but also learned much about how to do it. Poverty can be reduced, albeit not to zero. But a lot will have to go right if that is to happen. Consumption versus GDP/ "Growth Decreases Poverty"
In 1990-2010 the driving force behind the reduction of worldwide poverty was growth. Over the past decade, developing countries have boosted their GDP much stronger than in the period: 1960-90. This happened despite the worst worldwide economic crisis since the 1930s. The three regions with the largest numbers of poor people all registered strong gains in GDP after the recession: at 8% a year in East Asia; 7% in South Asia; 5% in Africa. ♦ As a rough guide, every 1% increase in GDP per head reduces poverty by around 1.7%! GDP, though, is not necessarily the best measure of living standards and poverty reduction. It is usually better to look at household consumption based on surveys. Martin Ravallion, a former World Bank's head of research, took 900 such surveys in 125 developing countries. These show, he calculates, that consumption in developing countries has grown by just under 2% a year since 1980. But there has been a sharp increase since 2000. Before that, annual growth was 0.9%; after it, the rate leapt to 4.3%. The country that cut poverty the most was China, which in 1980 had the largest number of poor people anywhere. China saw a huge increase in income inequality - but even more growth. Between 1981 and 2010 it lifted a stunning 680m people out poverty - more than the entire current population of Latin America. This cut its poverty rate from 84% in 1980 to about 10% now. China alone accounts for around three quarters of the world’s total decline in extreme poverty over the past 30 years. There is no sign so far that returns are in fact diminishing. The poverty rate has fallen at a robust one percentage point a year over the past 30 years. As countries get richer, the helmet moves to the right, reflecting the growth in household consumption. The faster the rate, the farther to the right the line moves, so the strong 4.3% annual growth in consumption since 2000 has pushed the line a good distance rightward. At the moment the world is at a unique sweet spot. More people are living at $1.25 than at any other level of consumption. This means growth will result in more people moving across the international poverty line than across any other level of consumption. This is a big reason why growth is still producing big falls in poverty. China passed the point years ago where it had more citizens above the poverty line than below it. By 2020 there will be hardly any Chinese left consuming less than $1.25 a day: everyone will have escaped poverty. China wrote the first chapter of the book of poverty reduction but that chapter is all but finished. The next will be about India. India mirrors the developing world as a whole: growth will push a wave of Indians through the $1.25 barrier over the next decade (see middle-chart above). The subcontinent could generate the largest gains in poverty reduction in the next decade! After that, though, continued growth will benefit relatively comfortable Indians more than poor ones. The last chapter will be about Africa. Only in sub-Saharan Africa will there be large numbers of people below the poverty line. Unfortunately they are currently too far below it. The average consumption of Africa’s poorest people is only about 70 cents a day - barely more than it was 20 years ago. In the six poorest countries it falls to only 50 cents a day. The continent has made big strides during the past decade. But even 20 more years of such progress will not move the remaining millions out of poverty. At current growth rates, a quarter of Africans will still be consuming less than $1.25 a day in 2030. The disproportionate falls in Africa's poverty rate will not happen until after that date.